Today's review has us exploring Valeria once again, after a successful foray into the Villages of Valeria. Quests of Valeria has gamers playing as guildmasters hanging out in the local tavern, looking to hire citizens of Valeria to go a-questing in order to score victory points. So is Quests of Valeria worth a trek off into danger, or would you be better off just staying at the local watering hole? Let's find out! Quests of Valeria is made up of like 98% cards with a few tokens. Let's talk about those tokens real quick and then we can chat about the cards. Cost tokens--There are six Cost tokens that show the cost of the cards underneath them ranging from 0-3. Also a little token that reminds you that you can hire someone from your hand by paying two other cards from your hand. Player/Action tokens--You play equal turns so one token simply keeps track of which player started the game. The Action tokens help you keep track of which Action you've used during your turn. This is actually very helpful, because you can combo up multiple effects, giving you tons of bonus Actions during your turn. Cards--There's a whole mess of them! Guildmaster cards--At the beginning of the game each player is randomly dealt a Guildmaster in secret. They look at it, and keep it facedown in front of them for the entire game. The Guildmaster earns you extra points for completing certain types of quests. Citizen cards--These each convey three different bits of information. Each Citizen has a Role (Worker, Soldier, Shadow, and Holy). Each produces some amount and combination of the game's three resources (Gold, Strength and Magic). And most of them also have one-time Citizen Powers that activate when you hire them from the Tavern (which is a thematic term for the lineup). Quest cards--Quests require specific combinations of Citizen Roles and Resources in order for you to complete them. Once completed they score VPs and give you bonus Actions similar to the Citizen Powers you get when you hire a Citizen. The Tavern is set up with six Citizen cards lined up under the Cost tokens. Each player is dealt a starting hand of three Citizens along with their Guildmaster (which is kept facedown). Turn up six Quest cards and you're ready to play! The WARLORD! The Assassin! The Mage!! And the...Baker...? On their turn players can perform any two of the following Actions (including doing an Action twice). Draw--Simply draw one card from the facedown Citizen deck into your hand. Hire--Hire a Citizen from the Tavern into your Guild (making a tableau in front of you). You must discard a number of cards matching the Cost token that Citizen is under, which could be zero, one, two, or three. If there's a Citizen Power on the Citizen, you also take that now, and that's still just part of that first Action. You can keep chaining combos as far as you can and want. Reserve--Select a Quest and put it in your tableau. You're the only one who can complete that Quest, but you can only have one reserved Quest at a time. You can complete that Quest with a later Action. Alternately, you can also choose to wipe the six current Quests and then you have to choose to reserve one of the new ones that comes up. The game boils down to strategically using your Actions to combo up cards to complete Quests and score points. The game ends once a player has completed five quests. You play an equal number of turns, and then everyone counts up VPs on Quests, and VPs from Lords of Waterdeep...I mean Guildmasters. Firestone--It's all about the combos with this one! Chaining this into that to do this other thing to fulfill that Quest is FUN, and satisfying. Although it was weird at first to get rid of the cards from your tableau as you pay for quests, it ended up keeping the game fresh. You couldn't just rely on one awesome card you'd managed to pick up. You had to start over with a new plan and new cards. I like that. Jeremiah-- Agreed, combos are king in this one, which in my opinion slows done the learning curve a bit. You can learn the mechanics of the game quite quickly, but to master it and learn the cards well enough to combo up, it's going to take some time. Definitely not an engine builder either since the tavern and your tableau/guild are in constant flux, so you're always shifting your strategy, which is fun! Firestone--There are a lot of comparisons between this and Lords of Waterdeep. And to be fair, the Guildmaster cards work exactly like Lords of Waterdeep cards. And the Quests you're completing are very similar to the Quests in LoW. But beyond that, I never felt like I was playing the card version of LoW, or Waterdeep Lite, as some people refer to it. There's no worker placement. You're building a tableau. There are crazy combos. It's feels completely different, and just isn't an apt comparison. Jeremiah--Yeah it's been some time since I've played LoW. There were slight similarities that helped some of my group grasp the concepts of the game a little quicker, but beyond that I felt like this is its own game and a fine one at that! Firestone--Holy cow, I LOVE the artwork in the this game. Some of it's lifted straight from other Valeria games, but others look original to this one. Jeremiah--Yeah. I'm really loving the commonality between the Valeria titles. It feels familiar, like you're stepping into a realm with some depth, and the aesthetics for both Valeria games I've played is TOP NOTCH! Firestone--Okay, I'm gonna have to be the one who says this: The game says it plays up to 5 players, but it should just say up to 3. To quote my friend Luke describing the first game: "It was while playing with five players that we discovered four is too many..." There's way too much downtime with 4 or 5 players. Since the board changes so much between turns, you can't plan your turn ahead of time. So every turn is starting from scratch and figuring out your move. That's fine with 2 or 3 players, but I will never play with 4 or 5 again. 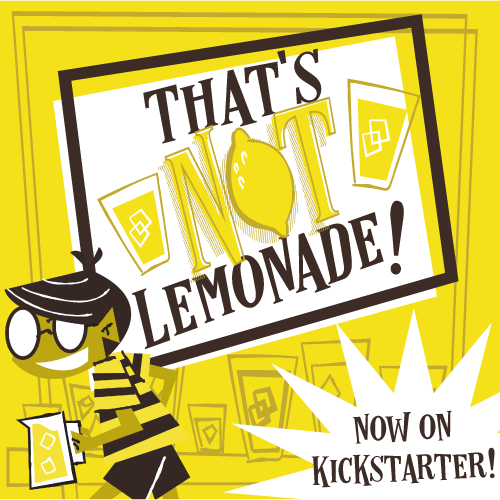 And what's funny is that it only goes up to five players because that was a stretch goal for the game on Kickstarter! Jeremiah--When I reviewed this in That's How I Roll that was the one weakness I found with the game. It doesn't bother me at all that the sweet spot is 3 since I don't often have a need for a 5-player game, and if I do, I'm probably going for something a little more casual/party game-ish. With 3 players it plays nice and tight and you can plan just enough to sometimes be successful as long as your opponents don't figure out what you're looking for and intentionally hose you. Firestone's Final Verdict--While I didn't like this quite as much as Villages of Valeria, Quests of Valeria is a good and solid game full of fun and satisfying choices and combinations. It's a perfect family game, and definitely staying in the collection. I can't wait to see what Valeria has in store for me next! Jeremiah's Final Verdict--Quests of Valeria adds another great title to the Valeria realm! Easy-to-learn mechanics with strategic depth add a ton of replayability to a tense and fun game! Quests of Valeria has earned a spot on my shelf! Theology of Games would like to thank Daily Magic Games for providing review copies of Quests of Valeria. This in no way affected our opinions of the game. Let's Put Ladder 29 Over the Top!